So exactly why is Binance coin (BNB) pumping? Well, everything has to do with the ambitions of the “humble” but strategic Changpeng Zhao. The maverick founder of Binance—who is categorical that the exchange is not for sale, led a BNB transition from Ethereum as it was an ERC 20 token to its own blockchain, the Binance Chain. Two weeks later and with Binance Coin (BNB) as a settling and native coin in use, Binance DEX promises to be transforming. Not only will users have full control of their wallets but the network is designed with speed and capacity in mind. Block time is one second—fastest blockchain and most importantly, it can handle the same trade volumes as centralized version. Add that to the requirement of crowd funding projects to accept BNB and it’s easy to see why fundamentals as well as candlestick technical considerations favor Binance Coin (BNB) bulls. Clearly, Binance Coin (BNB) is crashing records. Not only did it print new highs against Bitcoin (BTC), but the coin is now up 40.4 percent in the last week. That means, it is up to eighth flipping Stellar Lumens (XLM) and Tron (TRX). Gauging from candlestick arrangement and streams of supportive fundamentals, it is likely that BNB will edge higher. We cannot discount chances of BNB replacing BCH and Litecoin in the top five. For a clearer outlook, the weekly chart paints a rosy picture. Here we can easily note that the trajectory is northwards as BNB bulls bounce off the 78.6 percent Fibonacci retracement level of the coin’s high low. As bull momentum pick up, we can only project that prices will edge higher towards the coin’s ATM’s at $26—double the current market valuation. This projection is in line with Fibonacci retracement dictates. If that is the case, every low should be a buying opportunity with cross hairs first at $20—the 23.6 percent Fibonacci retracement level. Of note in the weekly chart is week ending Feb 10 bull bar. The high volume confirming bar did reveal demand in lower time frames because prices surged reversing losses of week ending Nov 25. Accompanying this upswing was a spike in participation—5 million against 2.5 million. Encouragingly, BNB trade volumes have been on the rise since after the completion of the three-bar bull reversal pattern of week ending Dec 23. Now, as long as BNB transactional volumes exceed averages, it is likely that BNB will pump towards $20 and later $26. 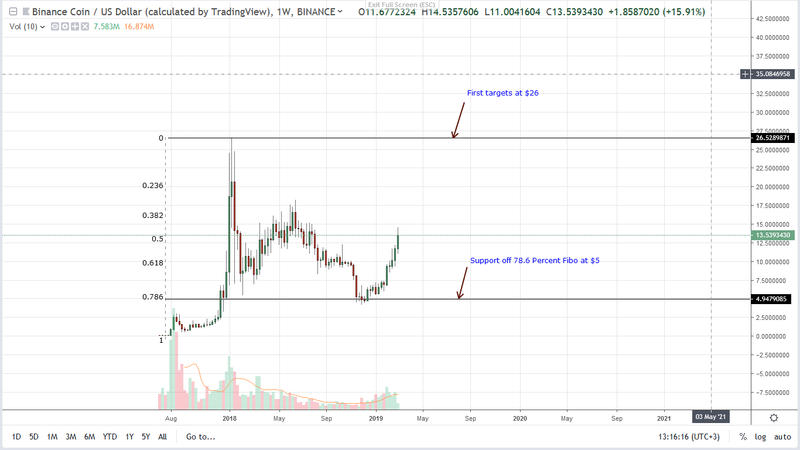 The post Binance Coin (BNB) Prices Can Double to $26 By End of Q2 2019 appeared first on Ethereum World News.